As I talk to a lot of moms of teens and ask about their kids, I typically hear about the struggles to achieve. Whether it be tryouts for a sports team, a certain score on an AP exam, practicing for a musical showcase, or getting into the college of choice, society places a lot of pressure on our kids to be the best. And, if truth be told, sometimes it is us as parents adding to the stress. Competition is stiff and as our kids move toward high school graduation, the stakes seem to be getting higher. After all, most kids are competing for those limited scholarship opportunities that we think our kids deserve. Yet, what I’m finding interesting as my kids have moved to become 20 and 30 somethings, is that a lot of those kids who pushed so hard to achieve end up losing in the end. When the competition becomes overwhelming, or stress of exams becomes too much, and even the pressure on the job seems formidable, they don’t know how to handle the feeling of ‘not measuring up’. They don’t know how to objectively look at a situation and know if it is good for them. I know that competition can be a good thing and high achievement is good for our society. Helping our kids to become independent and launch is what we should all be striving toward as parents. However, if we forget the connection part during the teen years, we’re setting our kids up for a lonely existence and the inability to assess their emotional needs in high pressure situations. I grew up in a family where emotions weren’t allowed. Tears meant I was a crybaby. Emotion meant that I wasn’t tough enough. Feelings were to be stuffed or people wouldn’t want to be around me. And jokes or silliness were instinctively inserted to take away the knot in the pit of my stomach. Avoiding anything emotional was the game that was played–not out of insensitivity but because it wasn’t in my parent’s vocabulary. Dealing with emotion hadn’t been passed down from their parents. However, we are emotional beings. God wired our brains with both the prefrontal cortex and the amygdala so that we can think and feel. Connection comes from the feeling part of our brain. And it is possible to under-develop the emotional part of our brains so that we stifle our growth toward healthy connection. Thankfully, what I have discovered is that emotional connection can be learned. 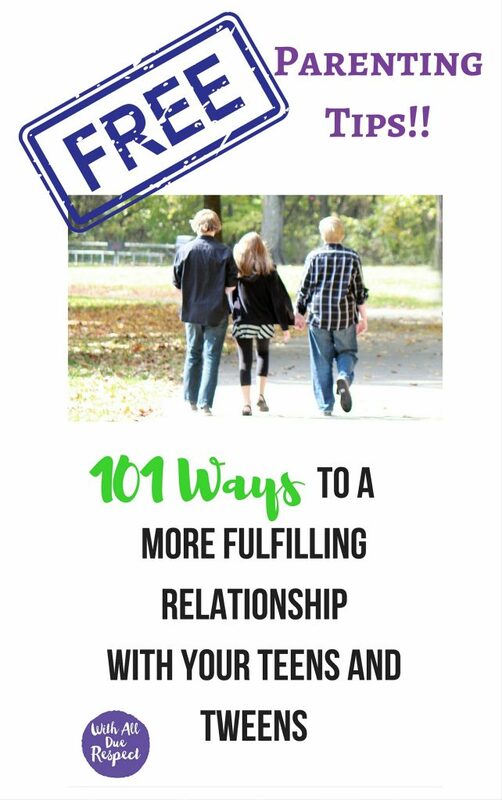 While it might feel foreign and uncomfortable at first and, like my experience, you might have to consciously think through the next step, the benefits for both us and our kids can be game changers when it comes to connection in the relationship. If you are like me and didn’t learn to deal with emotion as a child, you are probably stifling the emotional connection with your own kids. Here are some ways to recover what has been lost as you forge ahead toward becoming more emotionally healthy creating more meaningful connection with your own kids. Learn to notice when you are stressed out. What are you exhibiting? Name it. And when your teens challenge you by saying something like, “Why are you in such a bad mood?”, be honest with them. Let them know if you are feeling angry, sad, or upset and the “why” within reason. Comfort yourself. When you find yourself stressed out, allow yourself to feel it, name it, and normalize it. Give yourself a physical hug and let yourself know that you have a right to feel what you feel. Then ask yourself what you need. Comfort your kids. Physical touch, hugs, and soothing words go a long way in helping our teens know that even in the middle of what feels like disaster they will be okay. Say something like, “You seem to be really upset right now, would you like to tell me about it?” If they say “yes”, listen and validate their feelings. Ask them what they need from you. If they say “no”, respect their decision and let them know that you are available to listen when they are ready. Learning to connect emotionally with our kids is like being Jesus with skin on. Even though they are walking through an emotional valley, we have the ability to comfort them through our tenderness, our touch, and validating words so they have the desire to pick themselves up and move forward. By doing the same for ourselves and validating our own feelings, we are modeling healthy maturity in what life can be like when the chips are down and we ourselves become overwhelmed. This is showing our kids what healthy adulthood can look like. Do you wish you knew more skills to emotionally connect with your teen? Why not start a group with other moms to learn how. 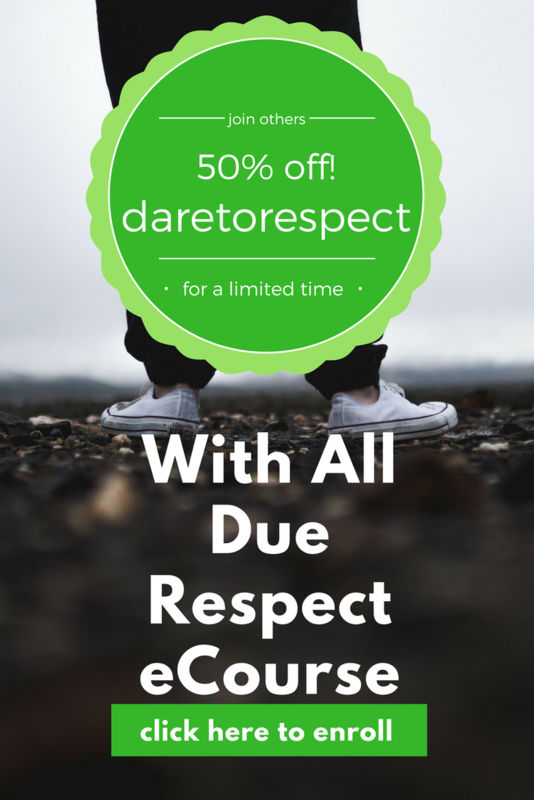 With All Due Respect: 40 Days to a More Fulfilling Relationship with Your Teens & Tweens is a great place to start. If you can’t find a group, feel free to join our on-line eCourse where you will find daily encouragement and can interact with other moms in the same place in the parenting journey. Another opportunity I’d like to share is our Deflating Defensiveness Training Retreat in Milford, Ohio that will be held June 27-30. There you will interact with moms who are brave enough to try out the skills in person in a safe environment. You’ll see behaviors taught, modeled, and you’ll have opportunity to practice. You’ll walk away with a new perspective on what relationships can be in your home.